“Any serious attempt to try to do something worthwhile is ritualistic.” – Derek Walcott, Born Jan. 23, 1930. Are you serious about what you're doing or what you want to do? I once heard a talk by late copywriter Eugene Schwartz where he talked about how he keeps his desk and surroundings when he writes. I know many other writers have their superstitions and good luck charms. I don't so much have a set writing ritual, but I do have an idea ritual, where I do my thinking in a room filled with books and toys and music. Rituals are about creating a pattern and imbuing that pattern with power and will and meaning. The idea is that these intentions and deliberate efforts will impart the work produced in that psychological space with the attributes that you want it to have. 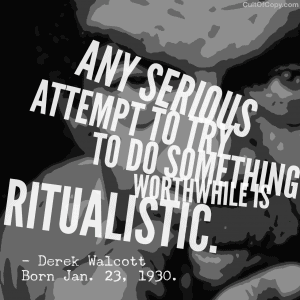 So think about your ritual. Who do you want to write as? Who do you want to write to? What do you want them to do with what you have written? What do you want to come back to you as a result of it? What tokens and thoughts can you surround yourself with to put that mindset into play? What constellation of objects and attitudes will help you work your magic to its full potential? Note: I don't believe in magic. But I believe in placebos if they are convincing enough that you BELIEVE they will work. Draw your circle. Light your candle. Open your book. Ring your bell. Prick your finger. It is done. Cast a deadly spell.